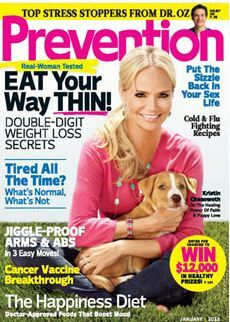 Strength Band Training co-author, Dr. Phil Page was recently featured in the January 2012 issue of Prevention Magazine. He was asked to develop a workout option for the feature, “One Woman / Three Workouts,” where 3 fitness professionals suggest a workout routine for someone in need of a specific fitness goal. Download the featured article here. 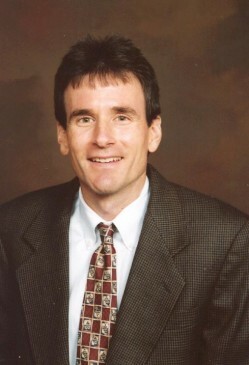 Dr. Page’s program included the Thera-Band® Band Loop. Is elastic resistance training effective for treating anterior knee pain? Anterior knee pain, or patellofemoral pain syndrome is a common condition associated with muscle imbalances, particularly at the hip. These imbalances are thought to lead to biomechanical changes that cause excessive load on the patellofemoral joint and associated structures such as the patella tendon. Elastic resistance is often prescribed as part of a physical therapy intervention for anterior knee pain, but its overall efficacy remains unclear. I was asked by the journal Sports Health to write a systematic review of the literature on the effectiveness of elastic resistance in the rehabilitation of patellofemoral pain syndrome patients. As you can imagine, there weren’t many studies, but I was able to come up with 8, peer-reviewed clinical studies that specified the use of elastic resistance. As with most reviews of clinical trials, it was difficult to make a definitive conclusion based on scientific rigor; however, each study found significant improvements in pain but they were designed without being able to isolate the effect of elastic resistance. From a scientific perspective, the conclusion is that elastic resistance training may help reduce pain and improve function and strength. However, from a clinical perspective, it’s clear that elastic resistance training is effective as part of a comprehensive treatment for patellofemoral pain syndrome. Clinical trials are often limited in clinical applicability because of a quasi-homogenous population—while all subjects may have patellofemoral pain syndrome, there are a variety of causes that may differ between individuals. For example, some pain may be caused by a functional muscle imbalance, while other pain may be caused by structural misalignment. As with any condition, the clinician must design an intervention specific to the patient based on a thorough history and examination. REFERENCE: Page P. Effectiveness of elastic resistance in rehabilitation of patients with patellofemoral syndrome: What is the evidence? Sports Health. 2011. 3(2):190-94. Bottom Line Secrets, a free e-newsletter, recently featured Dr. Phil Page in an article about simple exercises using elastic resistance for muscle imbalance syndromes. He provides simple exercises for knee pain, hip pain, as well as upper back and shoulder pain… Read the entire article below. When it comes to our muscles, stronger is better, right? Not necessarily. When one muscle is too strong compared to another, it creates an imbalance that leaves our joints vulnerable to inflammation, injury and pain. According to physical therapist and certified athletic trainer Phil Page, PhD, PT, coauthor of Assessment and Treatment of Muscle Imbalance, as we age, certain muscles typically become overstretched, which weakens them… while certain other muscles tend to shorten, becoming strong but tight. Scientists aren’t sure why this happens (though poor posture is a likely factor), but they do know that it causes abnormal wear and tear on joints. Example: In the shoulder joint, various muscles pull from different directions on the ball at the top of the humerus (upper arm bone). This keeps the ball perfectly centered in the socket, as it should be. But if the muscles at the back of the shoulder become weak (as they often do) and those in front become strong and tight, the ball is pulled slightly off center… which eventually leads to joint deterioration. Dr. Page explained that osteoarthritis often follows patterns based on muscle imbalances — for instance, weak muscles in the fronts of the thighs (quadriceps) plus tight hamstrings at the backs of the thighs (hamstrings) contribute to knee arthritis. Muscle imbalances also are associated with tendon problems, such as the painful inflammatory knee condition patellar tendinitis. Fortunately, we can reduce the risk for such problems with a workout specifically designed to restore balance to joints by strengthening weak muscles (or those likely to become weak) and stretching tight ones. Strengthen quadriceps. Start: Sit in a sturdy chair, feet together. Loop center of band around right ankle. Grasp ends of band in left hand… anchor exposed portion of band firmly beneath left foot. Move: Slowly extend right leg until knee is straight… hold for two seconds… slowly return to starting position. Do 12 to 15 repetitions (“reps”), then switch sides. Stretch hamstrings. Start: Lie on your back, right leg straight on floor. Bend left knee in toward chest and loop center of band around sole of left foot. With hands, grasp ends of band. Straighten left leg as much as you comfortably can, sole of left foot facing ceiling. Move: Keeping left leg straight, gently pull on ends of band to bring leg closer to you, until you feel a good stretch at the back of the leg… hold 15 to 30 seconds… return to starting position. Do three to five reps, then switch sides. Strengthen gluteus medius (outer hip). Start: Stand with feet shoulder-width apart. Loop center of band around right ankle… grasp ends of band in left hand… anchor exposed portion of band firmly beneath left foot. Shift weight to left foot. Move: Keeping knees straight and torso erect, raise right leg out to the side about 12 inches… hold for two seconds… slowly return to starting position. Do 12 to 15 reps, then switch sides. Stretch piriformis (buttocks). You do not need a band for this exercise. Start: Sit in a sturdy chair. Bend left leg and place left ankle over right knee in a figure-four position. Move: Without rounding your back, gently lean forward as far as you comfortably can… hold 15 to 30 seconds… return to starting position. Do three to five reps, then switch sides. Strengthen posterior rotator cuff (back of shoulder). Start: Tie one end of band around a fixed object (such as the doorknob of a closed door) at waist height… stand so that the object to which the band is tied is on your right side. Wrap free end of band around left hand… bend left elbow to 90° so left hand is nearly touching belly button. Move: Keeping left elbow tucked into your side and forearm parallel to floor, rotate the forearm outward (by rotating at left shoulder joint) so left hand moves slowly to the left (as if on a hinge) as far as you comfortably can… hold for two seconds… return to starting position. Do 12 to 15 reps, then switch sides. Strengthen rhomboids and middle trapezius (upper back). 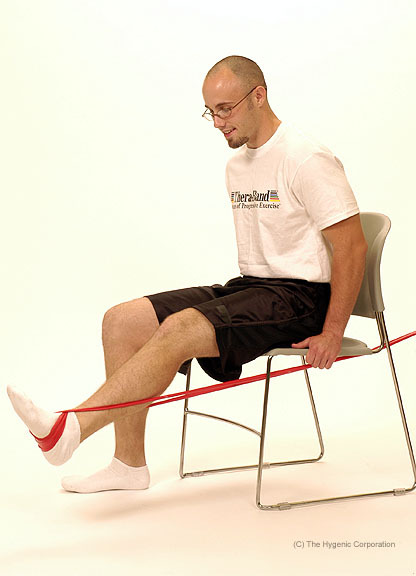 Start: Sit in a sturdy chair, feet together, legs stretched out in front of you, knees slightly bent… wrap center of band around soles of feet. Grasping ends of band, hold arms out in front of you, angled downward and fairly straight, so hands are at hip height. Move: Bending arms, pull hands in and up toward the sides of your waist, elbows pointing behind you. (Don’t move legs.) Keeping shoulders down, squeeze shoulder blades toward each other… hold for two seconds… slowly return to starting position. Do 12 to 15 reps. Stretch pectorals (chest). You do not need a band for this exercise. Start: Sit all the way back in a sturdy low-backed chair. Reaching arms behind you (and behind chair back), clasp hands at hip height, interlocking fingers so palms face each other and arms are fairly straight. Move: Keeping head up and neck relaxed, slowly raise arms as high as you comfortably can… hold 15 to 30 seconds… return to starting position. Do two to four reps. The Pittsburgh Post-Gazette recently had an article on elastic resistance training, “Resistance bands grow in popularity.” The second edition of Strength Band Training featuring Thera-Band resistance is also featured in the article. The article describes how physical therapists use the bands to rehabilitate body parts from the shoulder to the ankle, and from patients in wheelchairs to professional athletes. Fitness professionals suggest elastic resistance bands are increasing in popularity over free weights or weight machines. Athletic and functional movements require a strong core consisting of the muscles surrounding the trunk and pelvis: the abdominals and the low back. These muscles must function as movers, stabilizers, and force transducers. Functional strength of the upper extremities (used in actions such as throwing a baseball) is often built initially by the lower body and transferred through the core. While it's important to strengthen these areas individually, it's just as important to integrate these areas into functional strength through total-body exercises. Functional training programs should always include total-body exercises that facilitate core stabilization and force transmission between the upper and lower extremities. Elastic resistance exercises can create different vectors of resistance that challenge core stabilization muscles through extremity movement combined with movements such as squats or lunges. In addition, elastic resistance exercises can challenge the muscles involved in whole-body functional movements such as a lift or a push with a step. Secure one end of the band to a sturdy object near the floor. Lie on your side with your elbow directly under your shoulder. Use your other hand to grasp the band and perform a single-arm rowing exercise while lifting your hips off the floor and stabilizing the side bridge position. Slowly return. Excerpted from Strength Band Training, Second Edition (Human Kinetics, 2011). For more information on Strength Band Training, Second Edition or other strength and conditioning resources, visit www.HumanKinetics.com or call 1-800-747-4457.